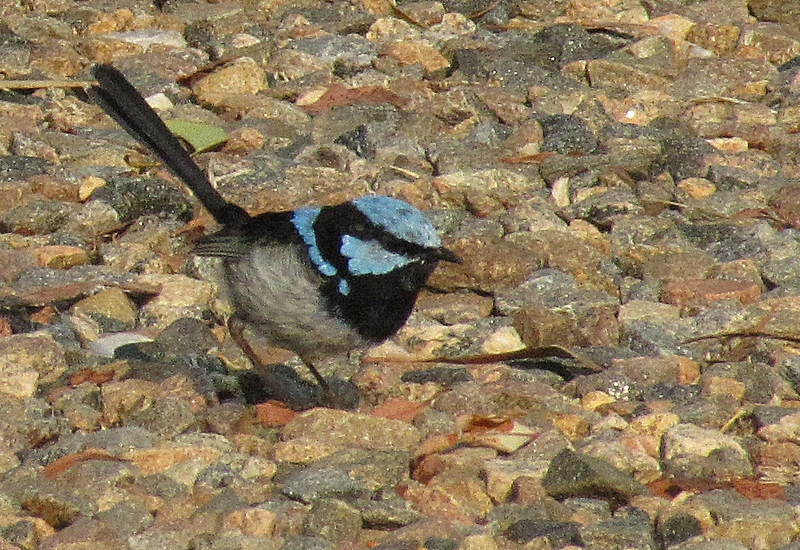 This morning my wife and I were in the sun room enjoying breakfast when a family of Superb Fairy-wrens came to the bird bath just outside the window. 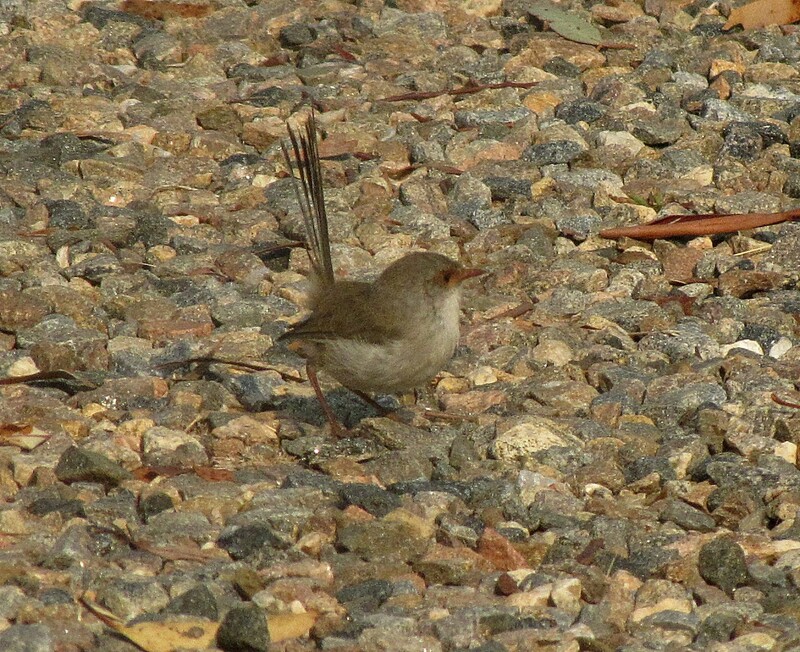 There was one male and two uncoloured birds, probably both females. This was delightful because we hadn’t seen or heard them in the garden for well over a week. They stayed long enough to have a drink and a short splash in the water. It wasn’t long enough to get any photos, so I have used a photo taken some time ago. The photo above was also taken in our garden a few months ago, so it it almost certain it is the same bird as the one we saw this morning. 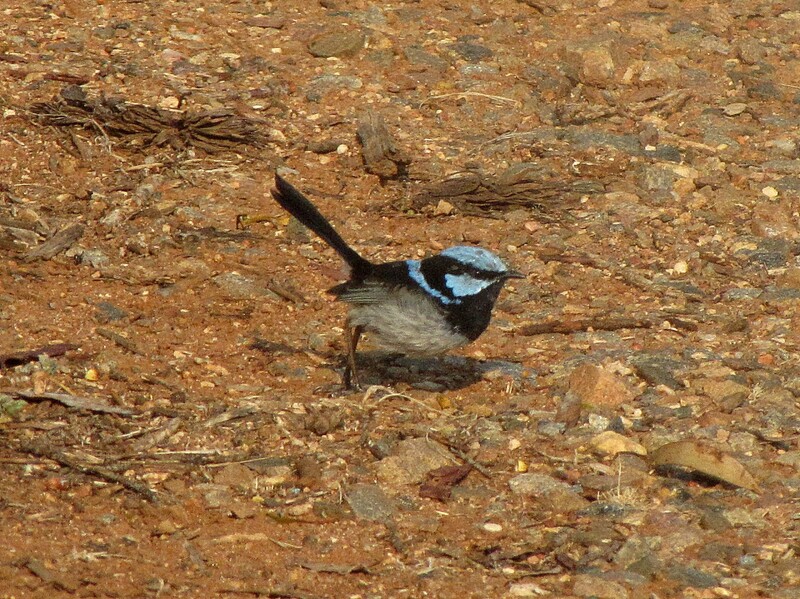 When I say “our”, I mean the family of Superb Fairy-wrens who have decided to call our garden their home. Ever since we got back from our recent trip to visit family in Sydney we haven’t seen or heard them. That’s nearly a month and we missed not having them around. This morning, while having breakfast in our sun-room, we saw two of them fussing around in the bushes near the bird bath. Both of them briefly visited the water for a quick drink. One was an uncoloured male and the other a female. Originally we only had two, a male and female. Then last year a third one joined them; we assume that they had nested and the third one was their offspring. Now where have they been for the last month or so? In fact, thinking about it, we haven’t heard or seen them since well before we left for Sydney about 7 weeks ago. Have they been quietly nesting somewhere? And if they have been breeding, how many in their family group now? I guess time will tell. 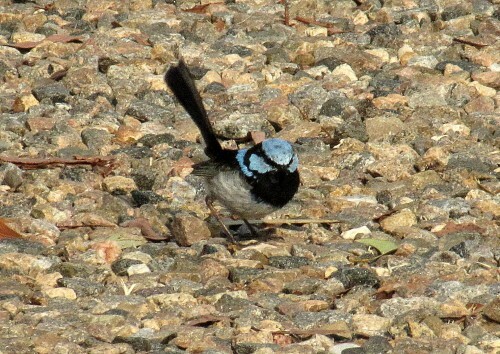 Meanwhile we are looking forward to their cheerful trilling as they feed in the garden and nearby mallee scrub. 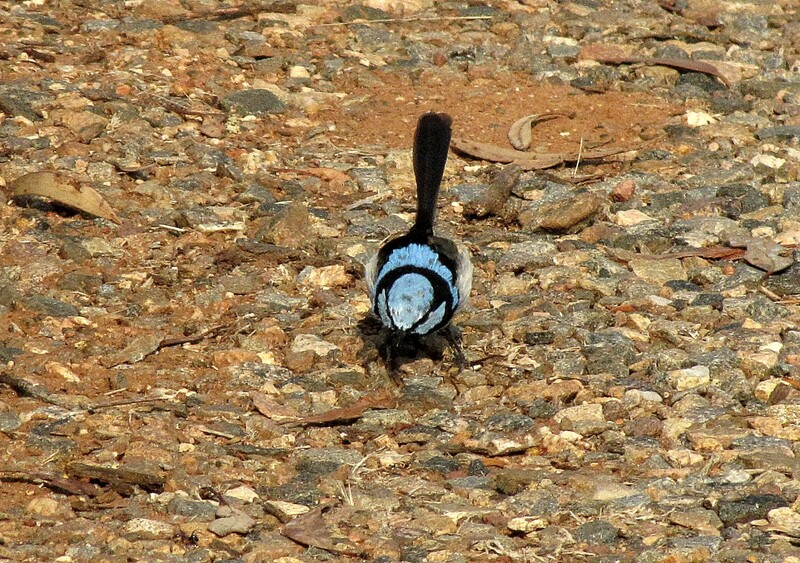 And we also enjoy seeing them hopping and flitting around as we go about our daily tasks. 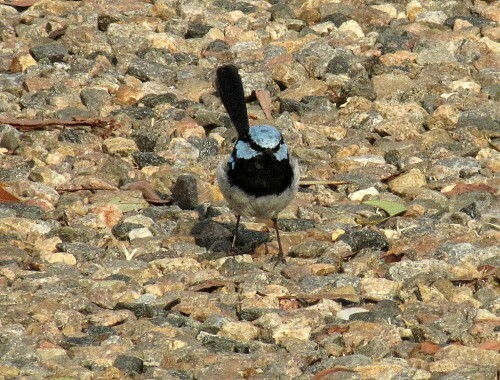 The photo of a fully coloured male above was taken in our driveway earlier this year. 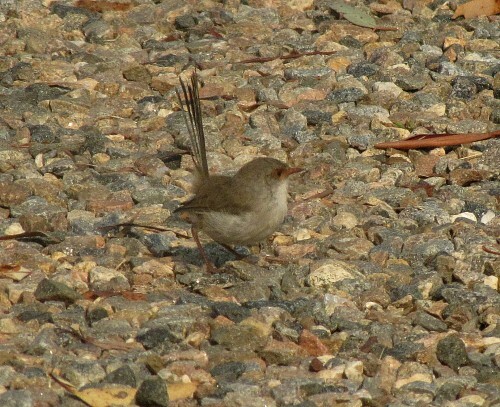 Over the almost30 years we have lived in our present home we have rarely seen any wrens in our garden, part of a five acre block of fruit trees and mallee scrub with some native Australian plants thrown in for good measure. In most cases these occasional visitors were the locally common Variegated Fairy-wren. 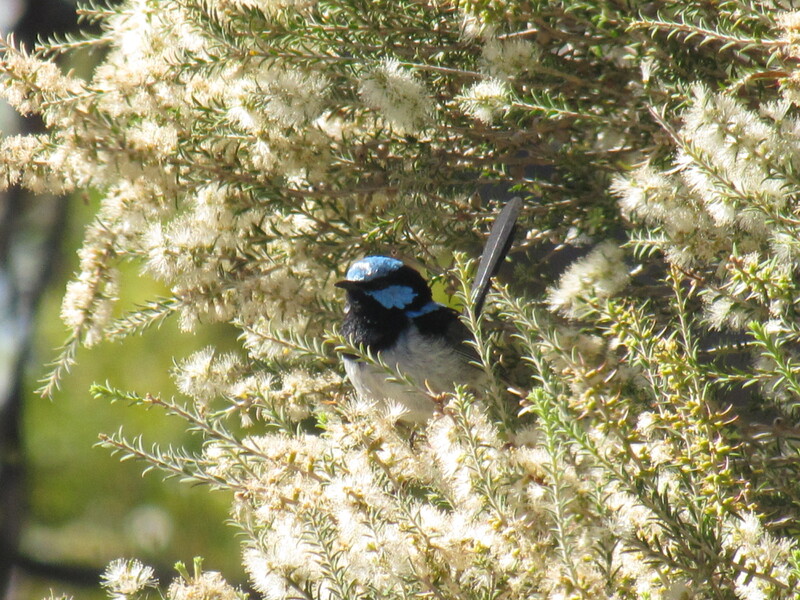 There are several thriving families up the hill in a mallee and native pine reserve about a kilometre away. 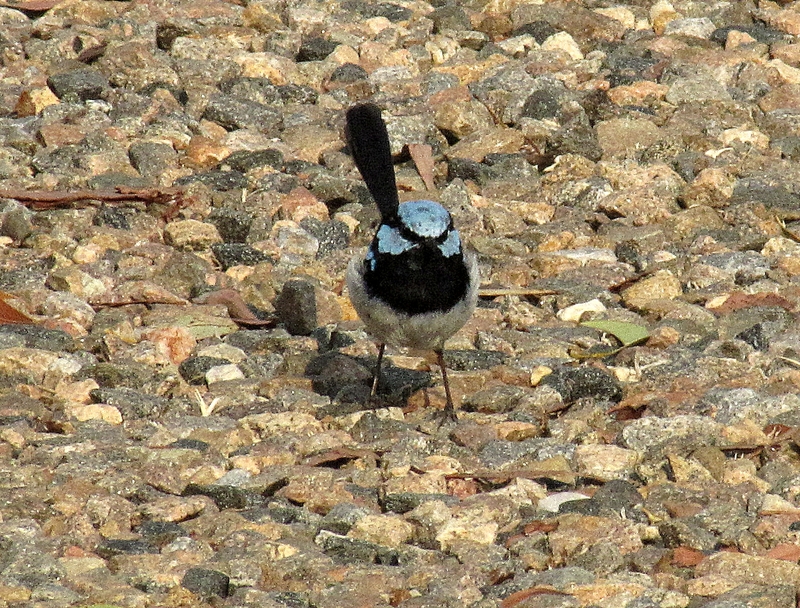 In other parts of Murray Bridge the Superb Fairy-wren is the common and dominant species. Just over a year ago we came back from an overseas holiday to be greeted with two Superb Fairy-wrens having quite happily taken up residence in our garden in our absence. It was a delightful welcome home present. In the coming months we saw them frequently, much to our continued delight. Then they went quiet for a few weeks. Mmmm… had they moved on, we wondered? To our increased delight they now number three: a coloured male and two uncoloured birds. Had they recruited another from nearby, or was the new one an offspring? We’ll never know. In recent days I’ve seen the three of them often, but sadly the male in in eclipse plumage and has lost most of his colour. In fact, he looks decidedly scruffy, not the magnificent colours shown in today’s photos. These shots were taken a few weeks ago. 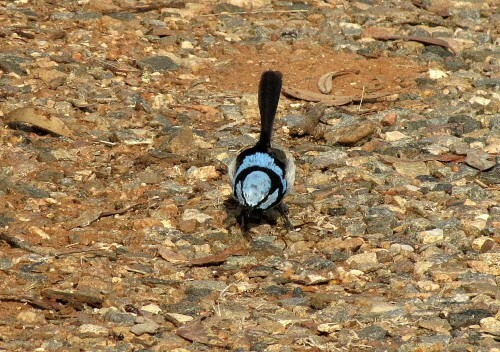 I also managed a good shot of one of the females (or uncoloured male?). I should explain that all of these photos were taken in our gravel covered driveway. Our garden is far more attractive than it appears in these photos.